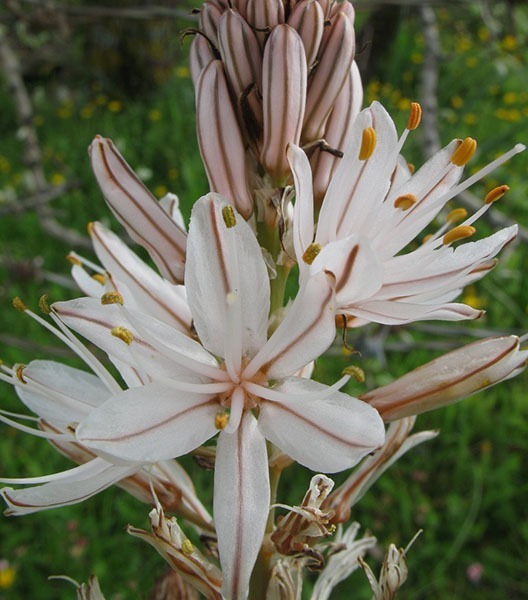 The family comprises of about 240 genera and 4000 species found in temperate and sub-tropical regions of the world such as Asphodelus tenuifolius. Most species are annual or perennial herbs. The important genera are: Lilium, Aloe, Allium (onion) and Asparagus. The representative species is Asphodelus tenuifolius (piazi). It is an annual weed. Radical, Sessile, Slender, Erect, Pointed, leaf bases sheathing. Scapigerous raceme. Flower borne on a long-branched stalk, the scape. The perianth is not differentiated into calyx and corolla. Tricarpellary, Syncarpous, Ovary: superior and trilocular with two rows of ovules in each locule, Placentation: axile, Stigma: trilobed. 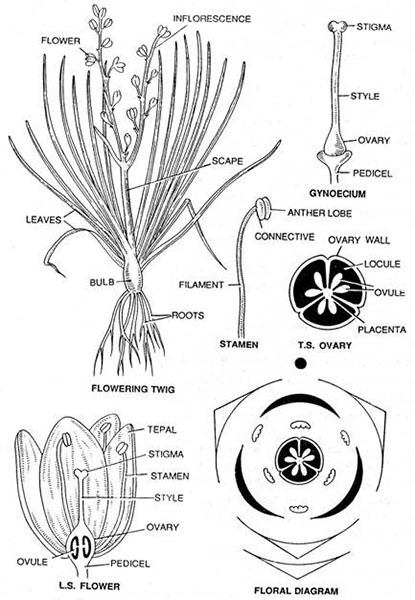 The floral structure of Asphodelus tenuifolius consists of L.S Flower, Floral Axis, T.S Ovary, Stamen, Twig, Gynoecium. The flowering twig consists of the following parts roots, bulb, leaves, filament, flower, inflorescence, scape while the L.S Flower consists of tepal, stigma, stamen, style, ovary, ovule, pedicel. The T.s Ovary consist of ovary wall, locule, ovule, placenta. The stamen consists of anther lobe, connective. Onion, Garlic, Asparagus are edible and used as food. Yucca and few others like Sanseviera guineensis and Phormium tenax yield fibres. Smilax, Aloe, Gloriosa and Urginea yield useful drugs. Dracaena yields red resinous juice, the “dragon’s blood”. Hundreds of species and varieties are in use ornamentals including such well known forms as Tulips, Hyacinths, Gloriosa, Lilies, Aloe, Tiger lily (L.tigrinurn), Easter lily (L. longiflorum), Aaparagus, Yucca, Dracaena etc.